Blanche potato wedges in boiling water for 1 minute, drain and dry on kitchen towel. Place wedges in a single layer onto two lined baking trays, drizzle with oil and season. Toss gently to cover well. Roast in oven for 20-30 minutes until golden and crispy. Shake tray every 10 minutes to ensure even browning. Divide yoghurt and kasundi between 6 x 250ml jars, to no more than half way full. 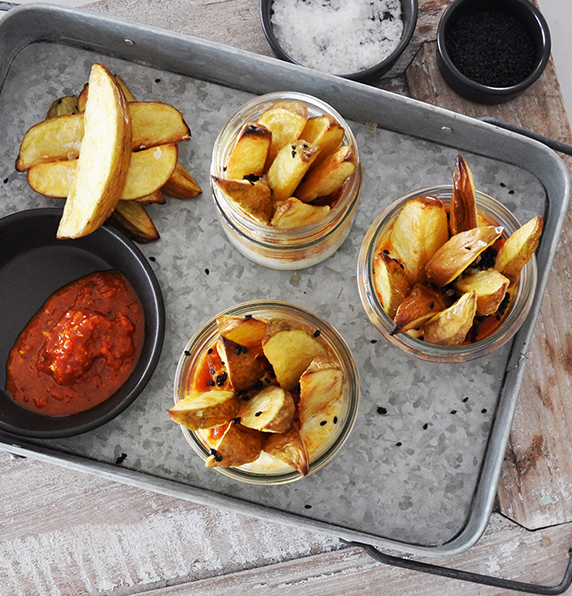 Fill each jar with wedges and sprinkle with black sesame.